The first factual primary source, to mention the Croatian (Hrvat) identity in the Balkans was that of Duke Branimir (Written in Latin: "Branimiro comite dux cruatorum cogitavit" c. 880 AD). Duke Branimir was a Slav from Dalmatia. 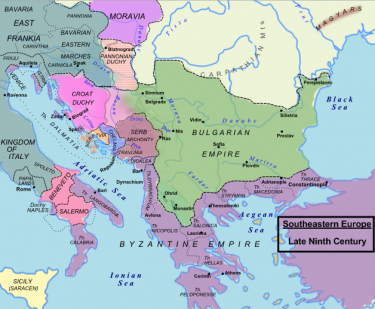 The term Slav was first used by the Byzantine's-Eastern Roman Empire (i.e. Procopius-Byzantine scholar, Jordanes- 6th century Roman bureaucrat) and was recorded in the 6th century (cia. 550) in Greek (Σκλαβῖνοι-Sklabenoi or sklaboi). Later in Latin, Sklabenoi was written Sclaveni. Ancient Greek-Roman communities prior to that refer to the early Slavic peoples as Veneti and Antes (from 2nd century onwards). Raid activity by various Slavic tribes within old Roman Dalmatia started in the 6th century. Hrvat is a word of Sarmatian (Persian) origins. In 1853 a Russian archaeologist Pavel Mikhailovich Leontjev discovered the Tanais Tablets. The Tanais Tablets mention three men: Horoúathos, Horoáthos, and Horóathos (Χορούαθ[ος], Χοροάθος, Χορόαθος). They are written in Greek and are from the 3rd century AD from the city of Tanais, today's Azov, Russia. At that time the region had mainly a mix of Greek - Sarmatian population. Tanais Tablet B containing the word Χοροάθος (Horoáthos). From the information above one can conclude that we are dealing with contact between Slavic and Sarmatian tribes from late antiquity. From a modern day perspective the Sarmatian historical footprint is non existent. All traces of these people have disappeared other than Slavic terms surrounding the word or name Hrvat which translates to English as Croat. Radoslav Katicich (Katičić) a Croatian linguist (and a classical philologist, Indo-Europeanist, Slavist and Indologist) said that the names from the Tanais Tablet are personal and not national ones. Furthermore it also could be said that these names are not related to any ethnic identity. Historically the term Croat became fully established as a constructed identity in the 19th century. Slavic tribes invaded the region of Roman Dalmatia in the early Middle Ages. 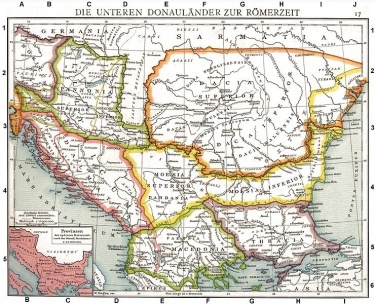 Contemporary historian Danijel Dzino states that the 19 century theories of mass movements of people into the old Roman Province of Dalmatia are questionable. Modern Archaeological and Scholarly research seems to be saying that we are looking at much smaller groups of Slavs invading the region. According to historians Florin Curta and Danijel Dzino the term Slavs was first used by outside observers of the day (Greco-Roman) to describe the newcomers. The Slavs used the term to describe themselves at a later stage. Thus began the construct identity of the new arrivals. Later the Slavic peoples started to identify themselves and separated (or were separated by others) into different groups. There was also a good deal of interaction between the groups as shown by DNA studies. 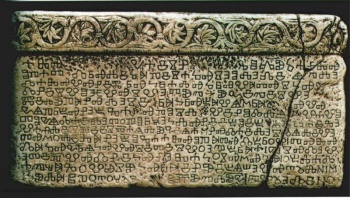 Baska tablet 1100 AD from Baska, on the island of Krk-Croatia. The issue of dates is an interesting one. Historians from the 18th and 19th century place the settlement of the Slavs into the Western Balkans in the 7th century but the more modern research undertaken by scholars and archaeologists cannot confirm this. The settlement of the Slavs in small groups has now been thought to be more in the region of the 8th century . The early sources must have reflected the raid and mercenary activity of the Slavic tribes within Roman Dalmatia. Also there are no contemporary written records about the invasion/migration/settlement, about the events as a whole and the area itself. Duke Branimir from the 880s, spoke old Slavic Chakavian and was from the Dalmatian hinterland. Mr Branimir is, I believe the first Croatian or the first Southern Slav to describe himself as a Croatian (recorded as such and based on the current records that we have). In my opinion his tribe, who were the old Slavic Chakavian speakers, are the first Croatians (the Harvat tribe, modern: Hrvati ). We can safely assume that Branimir's tribe goes back a few generations, especially since they had their own language i.e. Old Chakavian Croatian. The early medieval Western Balkans must have had multiple small Slavic ethnic tribes. In some cases the newly arrived Slavs lived amongst the population that was there prior to their arrival. It is my opinion that for whatever reason it appears that their history has not been recorded accurately or not recorded at all (it evolved into frontier country, 'borderland'). From a Greco-Roman perspective they were all identified as Slavs. Most probably based on linguistic-language classification. The Slavs found themselves living in a medieval multi-ethnic region; Roman Latin-Illyrian population as well as Liburnians, Greeks, Guduscani , Ostrogoths and others. It has been mention that there is an possibility that further back in time other ethnic groups were within the Slavic tribes themselves. This could explain the Persian (Sarmatian) connection. It was the most powerful chieftains (the main political players) who left a mark on history. Taking this into account, over a period of time in the middle ages we have new political identities of Southern Slavs emerging (regionally based or names brought with them). Among these were Croatians, Narentines, Bulgarians, Bosnians, Serbs (Raška) etc. It is true that some of the origins of some of these words denoting southern slavic groups (i.e. Harvat, Horvat) can be traced further back in history. Some have wrongly associated the etymology of these words to proclaim ethnicities or national identities back deep into the past. To my understanding there is no real hard historic proof that these ethnic identities existed (i.e. Harvat, Horvat). When the Serbian forces were annihilated in the Battle of Kosovo by the Ottoman Empire in 1389 very large groups of peoples started to migrate westward. The Ottomans (Turks) caused huge instability in the area and actually managed to twice besiege Vienna (Austria). The Western Balkans from that period forward began to acquire new groups of people in its regions (i.e.,Eastern Croats, Serbs, Albanians, Greeks, Turks & others), thus creating new ethnic mixes. I believe that due to these events the old Slavic tribal borders, what was left of them, changed forever during the 15th, 16th and 17th centuries. The old language groups which have become diluted over time and are slowly becoming extinct (now referred to as dialects) may reflect some of the many original Slavic tribes who invaded Roman Dalmatia. Distribution of central South Slavic dialects before 16th century migrations.In blue Chakavian dialect witch could have gone further south before they intermixed. The politics of language standardisation is the issue at heart when it comes to the telling of the story of the modern Southern Slavic languages. In the 19th century, Slavic language standardisation (Neo Shtokavian) entered firmly into the mix. This event had a huge influence on the region and its impact has to be fully examined. One question which can be asked. Did the 19th century scholars and linguists do their research scientifically or were they seriously influenced by the politics of the 19th Century Pan Slavic movement? Plus - is it continuing today? In this editors opinion, the answer is yes - they were very seriously influenced by the politics of the Pan-Slavic movement? The Pan slavic movement was heavily influenced by European Imperialism with an overriding attitude directed towards creating a unifying language for a state that negated the history of the various southern slavic and other language bases that were part of the Western Balkans. With this in mind the linguist of the day created a construct Serbo-Croatian language (or Croatian-Serbo) with a Neo-Shtokavian base. In 1918 a construct Neo Shtokavian (Serbo-Croatian) language was introduced by government policy as the main language to be used within the created state of Yugoslavia (a mini version Pan-Slavic state). Before Yugoslavia was established the policy had already started to be implemented by the Austro-Hungarian Empire in the west-end of the Balkans and it was also being implemented in the east, in the Kingdom of Serbia. 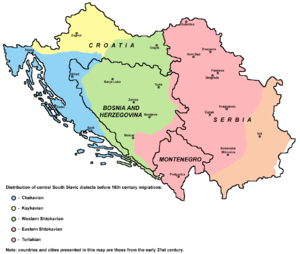 There appears to be a common misconception in the former Yugoslavian regions that if you are taught and you learn to speak the standardised Serbo-Croatian language (Neo Shtokavian) that you have historical connections to a particular ethnic group. This is not necessarily factual as many other ethnic groups, with various ethnic backgrounds, were caught up in this system of standardisation. These people were being forced to speak a common standardised language (Serbo-Croatian, Neo Shtokavian). This does not accurately reflect the actual ancestry and ethnic history of the speaker (i.e is a Welshman a Englishman now that he can speak English?). Another important question to ask is how far back does one go in proclaiming Croatian Identity and nationhood (or any other nationhood)? In the past the Yugoslav Communist party, Pan-Slavists and the Croatian Nationalistic movements have taken this to extremes. These extreme Pan-Slavic, Nationalistic and Communist ideologies, regarding language, ethnicity and history who are clinging to beliefs based on a false history of a single nationhood have created a great deal of pain, destruction and falsehoods. For example does a seventh generation Australian with English background start saying in modern Australia that he is a Saxon and start a nationalistic movement to assert his beliefs upon others. On the other hand certain historic perspectives in which it is states that there is no Croatian Identity or medieval peoples is incorrect. From this Editors perspective there is strong evidence that we are looking at a tribe that settled in the northern Dalmatian Hinterland and it's surrounding area who for a brief moment in history dominated the region of the western Balkans. 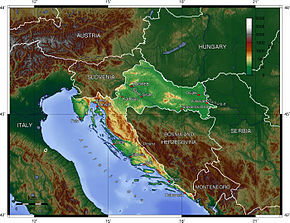 Medieval Croatia evolved from the former province of the old Roman Empire named Dalmatia. After the collapse of the Roman Empire, from 480 to 535 AD Roman Dalmatia was ruled by the Ostrogoths (a Germanic tribe related to the Goths). When the Ostrogoth Kingdom cease to be it was divided between the Byzantine Empire (Eastern Roman Empire) and the Carolingian Empire - Franks (the old Roman neighbouring province of Pannonia was at one stage under the Avar). Both the Byzantine Empire and the Carolingian Empire created their own Dalmatian Ducatus. The former Roman province of Dalmatia had a Roman Latin-Illyrian population as well as Liburnians, Greeks, Guduscani , Ostrogoths and the late arrivals, Slavs. With time one of the Slavic tribes  within Dalmatian Ducatus of the Carolingian Empire became the political elite and the leaders (dux) of the province. The fore-mentioned Slavic political elite from the late 9th century onwards were referred to as Cruatorum. This is when the first time that the Croatian identity (Hrvat) was used c. 880 AD. Cruatorum is a Latin translation of Hrvat. During this period the Dalmatian Ducatus became independent and was renamed Ducatus Croatiae. Later it became a kingdom that was called the Regnum Chroatorum (Kingdom of Croatia 925–1102 AD). It had no permanent seat. Nin, Klis, Bijaci and Knin where some of the towns that have been mentioned. It could be mentioned the Croatia of old had a major influence on the region in terms of language. Croatian Slavic Chakavian became Lingua Franca of the area and started to replace Latin Dalmatian (Romance). This was more present inland at first than on the Adriatic coast. ^ Note: The Sarmatian tribes have been referred to as being Persian in origin (modern: Iranian people). ^ Note: Other peoples in the region were Liburnians (related to Illyrians), Celts, Greeks, Latins, Guduscani ("It has been assumed, that they were part of the Vandals, Goths or Lombards." referenced from: self.gutenberg.org: ), Ostrogoths (the last mentioned Germanic tribe is related to the Goths). ^ Note Baska tablet was translated in 1875, it's language is Old Slavic Croatian Chakavian with elements of liturgical Church Slavonic. ^ It is believed that Hrvat in medieval times was pronounced "Harvat or Hrovat". It was translated to Latin: Chroatorum and then simplified to Croatorum. ^ self.gutenberg.org: "It has been assumed, that they were part of the Vandals, Goths or Lombards." ^ Bulgarians also have a strong historic association with Turkic semi-nomadic tribes. It has been written that in early medieval times the Bulgar elite spoke a language that was a member of the Turkic language group. ^ Other languages commonly used in the region included, Romance Dalmatian, Old Venetian, Hungarian (Magyars) and written Latin. ^ "Avar, one of a people of undetermined origin and language, who, playing an important role in eastern Europe (6th–9th century)" referenced from: http://global.britannica.com/EBchecked/topic/45428/Avar The Slavs and Avar at one stage had a shared history. ^ self.gutenberg.org: "It has been assumed, that they [Guduscani] were part of the Vandals, Goths or Lombards." ^ The term Slav was first used by the Byzantines-Eastern Roman Empire (i.e. Procopius-Byzantine scholar, Jordanes- 6th century Roman bureaucrat) and was recorded in the 6th century (cia. 550) in Greek (Σκλαβῖνοι-Sklabenoi). Later in Latin it was written Sclaveni. Brill Academic Publishers: "Founded in 1683, Brill is a publishing house with a rich history and a strong international focus." This page was last modified on 17 April 2019, at 05:06.